SM48-LC, Dynamic Microphone from Shure. The SM48LC has a cardioid pickup pattern that is suppose to only pick up what you are recording and not pick up external noises and sounds. It does not do that very well, so when recording with it you will need to make sure that you are in a completely quiet room or you will hear everything that is going on around you in your recordings. This microphone is geared more toward someone with a very small budget and wants to record vocals at home. But honestly you are better off getting a cheap USB microphone, it will be about the same price and it will be more portable than this is. After you purchase the SM48LC you will also get a carrying bag and a stand adapter. There is no pop filter needed because it has one built into it. That is about the only positive thing I can say about this microphone is that it does a good job with the popping sounds. The overall quality of your recording will not be bad as long as your environment around you is quiet. With this microphone being the price that it is, you mine as well spend 10 more bucks and get a better microphone from Shure. This microphone let me down way too many times and I am not very happy with it. I was using it a long while ago probably back in 2005 but it was a horrible microphone then and it still is. If you are going to record where you live there really is no way you can stop the sounds around you like other people in the house and street noises. You will have to have a completely quiet room to work with this microphone. I do not recommend it unless you live in a quiet box! Spend a little more money and at least get something that you will be happy with and work no matter what your recording conditions are. AlanForPresident's review"cheap sound, not worth it"
The shure SM 48 LC is a cardioid vocal mic that I didn’t like that much. Shure really didn’t seem like they wanted this mic to sound great, seems like they made most of the other cheaper mics they make at least sound decent but this mic did nothing for me and was a horror to record with at home. It sounds like a very cheap vocal mic that you can purchase at almost any store like Kmart or stores like that. There was nothing special about this mic that made me want to use it for more than a week. I used it for 1 song, it sounded awful, then I thought that I could boost some frequencies or add some stuff to it to get it clean and crisp but nothing worked. I re recorded the song hoping that maybe it was my fault but there was nothing I could do to fix how it sounded. Its just a flat out cheap mic, I purchased it for around 45 dollars at a used auction. I think they go for 60 brand new now, or at least at the time. I just had no idea that it was going to sound as bad as it did. Shure mine as well not even make this mic, I don’t understand why they did it just makes them look bad. I would only recommend you get this mic if you get it used for about 25 bucks and you have no money to buy something better, and you just need to record some really rough stuff at home. that’s all you will be able to do with this mic. 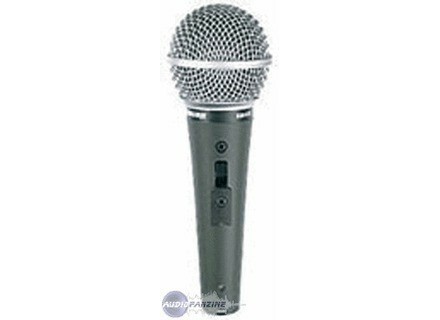 I wouldn’t record a song with this mic and let people hear it because it will sound very unprofessional and make you sound like an amateur. The whole purpose of recording at home, is to make it sound like you arent recording at home. that’s why we all want to have a good mic. This mic wont work for me. I use it as a backup when I have no further opportunity for voice. It's a dynamic. I use it for 1 year. I bought used for 75. I lost 75. For Shure, it's a shame. He has no chest. "If I'd known, I would not v'nu."